When I was ten years old, after the Khmer Rouge had been overthrown by the Vietnamese Army on January 7, 1979, my brother and I were reunited and along with many other kids at the Youth Labor Camp head home to our respective villages. After arriving at the village, my brother and I were desperately searching for my parents and sisters. We were ecstatic to find them alive and that they had survived the Khmer Rouge. Later on, we learned that my uncle, my mother’s brother, and his entire family of five had been taken away and executed at a mass grave, one of many killing fields. My father's younger brother's wife and her son died from malnutrition and disease. I was also very saddened to learn that both my grandmothers from my father's and mother's died of starvation. We found my father in extremely poor health due to starvation. 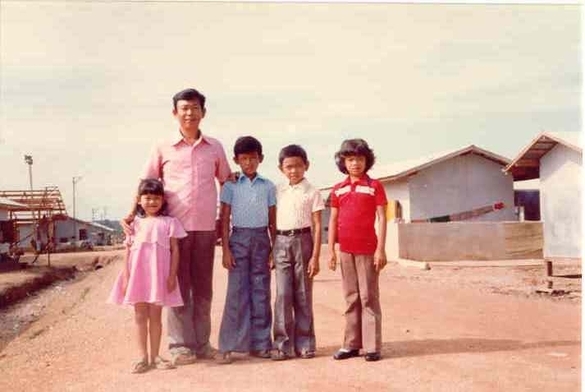 My brother and I found my parents and sisters in a small village outside of Phnom Proek, near the Thailand border. They were kept in this village along with many other families and forced to work in the rice fields. Just like my brother and I, my parents were slave laborers working every day from early morning to late in the evening planting, cutting down, and bundling rice straws in the fields for harvesting, and building water reservoirs with little to no food to eat. My mother recounted some of her stories, which included the time that she had been beaten several times by a group of young Khmer Rouge girls for picking up leftover rice straws off the ground. She was starving at the time and desperate wanted to share the leftover rice straws with her family. The young Khmer Rouge girls viewed this as stealing and punished her severely. The young Khmer Rouge girls were biased as they sometimes turned a blind eye on other laborers for picking up leftover rice straws. As for my father, his health had been deteriorating in the last year of the Khmer Rouge's rule due to malnutrition. It was a miracle that my father had survived. My parents had witnessed countless families and friends die from starvation, disease, work exhaustion, and execution. Although we spent almost two weeks in this village getting our footing in place, we were mainly scouting for food such as rice and vegetables so that we could survive. This allowed every one to recover, especially my father. It was a different experience, and we felt the freedom in going places to find food. We did not have to worry about getting caught and punished severely for salvaging through the rice paddies. It is amazing what food can do for you physically and mentally as we all slowly recovered from excessive malnutrition. My infected left leg slowly started to heal as well. Once we had amassed enough food supply, we decided to migrate to the city of Phnom Proek, a relatively small city close to the Thailand border. It took us one to two days to walk to Phnom Proek. Once we’re in Phnom Proek, we found a vacated area on the front porch of a small building along with thousands of other people also storming into this city. Like us, they were hoping to cross the border into Thailand to find a better life. There was no Red Cross in the city to assist any of us. We continued to survive on a daily basis by searching and hunting for food. We were looking for food in the rice paddies, catching fish in the rivers, trapping animals in the wild, and looking for anything else we could find to survive. My parents were preparing us to eventually cross into Thailand. They had heard stories of dangerous bandits and landmines along the border jungles of Cambodia and Thailand. After about two and half months of preparing, in April 1979, my parents decided it was time for us to attempt to cross into Thailand. My parents along with other families lined up two smugglers to take us across to Thailand. The smugglers promised to take us along a safe route to elude bandits and landmines. In return, they charged a certain amount of gold per person. There were about eighty to ninety people in our group. We spent the day walking from Phnom Proek to the border. We camped at the border until nightfall when each family paid the two smugglers per the agreed gold price. We started to walk across the border when it had become pitch black, in order to reduce the chance of running into bandits. After one hour of walking deep into the jungle, the two smugglers stopped and recounted the number of people in the group. In their counting, they found one extra person who had not paid. We were stalled for an hour until a family helped to pay for this person. It turned out this young man was a sole survivor as he had lost his entire family to the violent bloodshed perpetrated by the Khmer Rouge. We proceeded to walk for the next several hours. I remembered the sky was crystal clear that night, and the jungle was so quiet yet I could constantly hear a chirping sound. I was so tired that I remember walking right into a big tree at one point. At dawn, to our surprise, the two smugglers left us but had pointed toward the direction we needed to continue walk. We were upset and confused but agreed among ourselves to continue walking in that direction. Shortly afterward, we were met by a group of Cambodian bandits. They looked through our bags for valuables and searched each one of us thoroughly. I remember my mother quickly took out a banana rice roll that she had made to feed to my younger sister. One of the bandits wanted to take away this banana rice roll but my mother quickly broke the roll in half and crushed it in her hand to show him there was nothing inside. It turns out that my mother had hidden gold nuggets in the other end of the banana rice roll that was still wrapped in her palm. For the next few hours, the bandits stalled the group as they were talking amongst themselves. They finally let us go, and we continued walking for several hours. Once into Thailand, we came across a group of Thai bandits. They did the same to us by searching through our belongings. As luck would have it, they did not search my little sister which was where my mother hid her gold around a money belt she had custom made for this journey. Eventually, we were received by the Thai border soldiers and transported to the refugee camp outside of Aranyaprathet, Thailand. Some believed that the Thai bandits and Thai soldiers were one and the same. "In June 1979, the Thai government forced more than 40,000 Cambodian refugees back into Cambodia at Preah Vihear﻿ temple. 3,000 or more Cambodians were killed attempting to cross a minefield. The Preah Vihear incident stimulated the international humanitarian community into action to help Cambodians who often arrived at the Thai border in the last extremity of starvation." Under international pressure in the coming months, Thailand revised its refugee policy but the damage had already been done to us and the more than forty thousand unlucky Cambodian refugees. We witnessed the sick and the elderly being left behind as the Thai army fired their guns up in the air to force people to descend down the steep mountain. It took us days to reach the bottom of the mountain. Some families had to leave their elderly parents behind as they could not carry them. We saw one mother drink the urine of her child to survive. At the bottom of the mountain lay the Cambodia-Thailand border, which was littered with landmines. These landmines were placed there by the Khmer Rouge, the Lon Nol government and the Thai army. We saw families being blown up during the chaos. We felt trapped and I remember I was extremely nervous, full of anxiety. Our chances of survival seemed grim and my mother commented that had she known this would occur, she would have wanted my brother and me to escape at the bus stop in order to attempt to survive in Thailand. It was not until the Vietnamese soldiers came to our rescue by sweeping out the landmines that we had order and a sense of calm. Because there were so many people and so many landmines to clear, the Vietnamese soldiers placed stick flags to designate the presence of the landmines. We were forced to be methodical and walked only in single line following a path dotted by the stick flags, and once an area or sector had been declared safe by the Vietnamese soldiers, we allowed ourselves to rest and sleep in a small area. It took us days to navigate through the landmine areas. In the end, it is estimated that more than three thousand Cambodians were killed attempting to cross the minefield. Afterward, we had no choice but to walk for the next two months to Phnom Penh. Our morale was very low, especially that of my parents. For the next two months, we were on foot walking every day from morning until evening, carrying and pushing whatever belongings we had at the time, which amounted to some clothes, pots for cooking, and leaky tents. The distance to Phnom Penh is over 200 miles or about 322 km. Some days were impossible to travel due to heat exhaustion, heavy rain, tiredness, and voracious hunger. A lot of people gave up during this journey and opted to settle at the small villages along the way. This was especially difficult for my parents as all of us children were still very young. It was the courage, conviction, and strength of my parents that enabled us to continue the journey. We would survive on a minimal amount of rice given to us by kind hearted farmers/villagers and what we could find in the fields. Some nights during the rain, our small and leaky tent was dripping with water. We had to sleep in a sitting position back to back with my siblings and parents. As a young boy, I vividly remember night after night of being very hungry, and thus I would daydream that one day when I had enough rice, I would stuff all of it in my pockets so I would never run out of rice. This is one of the reasons I absolutely hate to waste food today either at home or at the restaurant. 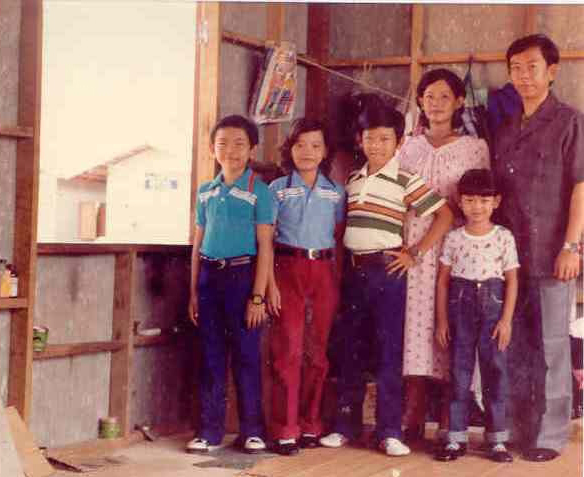 In August 1979, my family arrived in Phnom Penh after being forced to evacuate on April 17, 1975. We found a tiny area on a hospital floor in a hallway littered with people just like us, which had barely enough space for our family to live. For the next five to six months, my mother would cook Cambodian bakery goods for us to sell in the street market in exchange for rice. We would then exchange the rice for Vietnamese paper money. Vietnamese money was good at the time as the Vietnamese ran the country. My parents along with my brother and I went to see our townhouse before we were forced out by the Khmer Rouge. Unfortunately, the Vietnamese soldiers would not allow us to enter the townhouse. However, we were able to sneak around the back of our townhouse and witnessed the aftermath of the war-torn rubble and looting inside our townhouse. We looked through the rubble and found a beautiful picture of my mother taken when she was around 22-23 years old, standing next to our car. One evening after supper time, a group of bandits came into the hospital hallway and forcibly searched our belongings and all the adults for valuables. They took what they wanted and my mother continued to hide valuable items such as gold and Vietnamese paper money in the custom-made belts worn by my two sisters. In December 1979, my parents wanted to make another attempt to reach Thailand, in the hope of getting sponsored to the United States. It was this hope and dream that caused my parents to continue to take enormous risks. They were fearful of the lawless countryside as the country was still in chaos because of the Vietnamese occupation and Cambodian resistance groups. For this reason and because of the difficult and unknown journey, most of the other families we knew including our own relatives decided to continue living in Phnom Penh. Nevertheless, my parents had always believed that a better life existed outside of war torn Cambodia. My parents, especially my mother, had prepared for this journey by preparing food for us to take and securing our valuables. We packed up our belongings and started our journey on foot toward Thailand once again. We walked and hitchhiked whenever possible along the way on passing cargo trucks. Most of the cargo truck drivers wanted something valuable in return. My mother used what we had of the Vietnamese money, jewelry, and some gold. My parents felt safe whenever we were hiding inside the cargo trucks to avoid run-ins with the bandits. It took us a little over two weeks to reach the border. 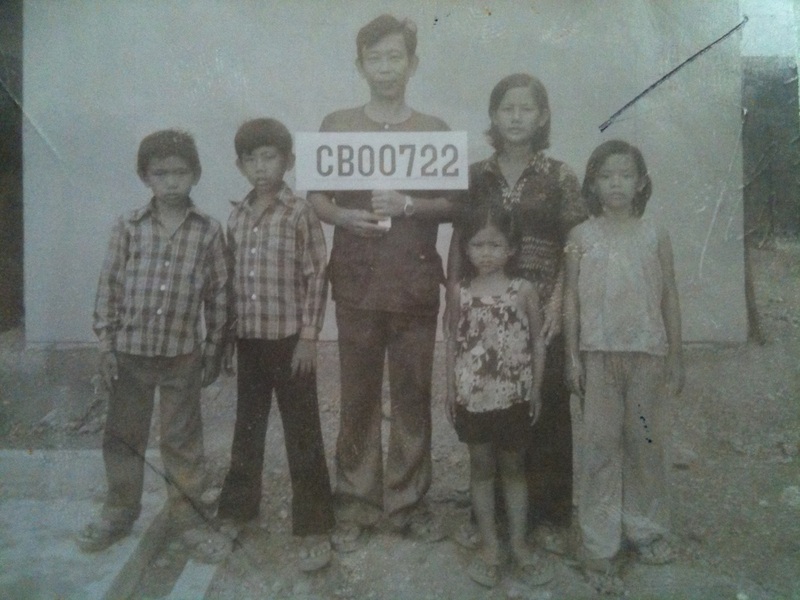 On the Cambodian side of the border, my parents and other families arranged with the smugglers to take us across to Thailand in exchange for some more gold. It was the same drill we had gone through the first time we had crossed into Thailand. Once again, we started on our journey on foot toward Thailand after nightfall. We met up with the bandits and they took what they wanted from us. There were some women that swallowed gold into their stomach to avoid being taken by the bandits. During the day, we were met by the border Thai soldiers. They walked with us for several hours until we arrived at the Khao-I-Dang refugee camp toward the end of November 1979. Khao-I-Dang refugee camp was located 20km north of Aranyaprathet, Thailand. This camp was one of several refugee camps established by the United Nations High Commissioner for Refugees (UNHCR) in Southeast Asia to help the Cambodian refugees to resettle in other countries. 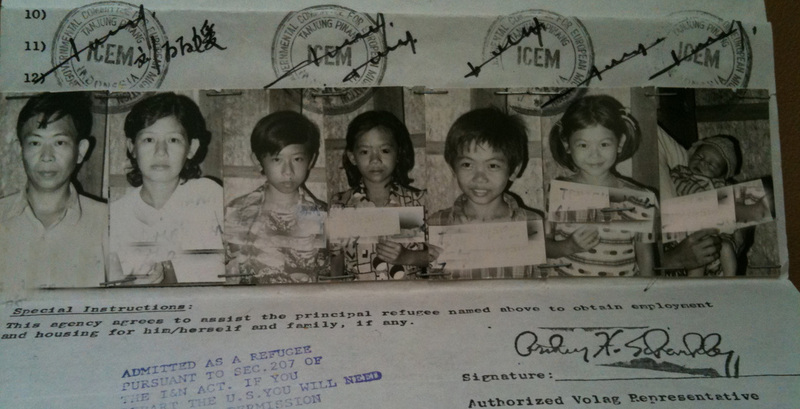 We were one of the very first groups of refugee to arrive at Khao-I-Dang which opened on November 21, 1979. The camp was situated on a sparsely wooded plain along the Cambodia Thailand border. The construction of the camp was made up of thatch housing huts with basic dirt roads and water tanks. We saw new refugees arrive on a daily basis. We were given some clothes by the International Red Cross and Volag which is a portmanteau of voluntary agency. Volag refers to any of the ten United States private agencies and one state agency that have cooperative agreements with the U.S. State Department to provide placement services for refugees. And for the very first time, we were given identities through the registration process. Each one of us was given a translated English name based on its equivalent sound in Khmer. As it turns out, some of our names including our last name sound completely different in English but we did not know that at the time. As for my birthday, my parents do not know the exact date I was born; they only remember the month. So using a bit of guesswork, they put down my birthday for the first time. This is also true for the rest of my siblings. To the left is a family picture with an alphanumeric identification of the family at the registration. 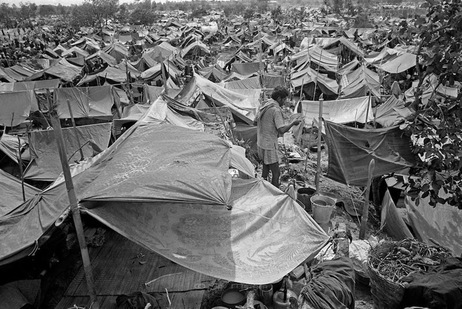 ﻿We stayed at Khao-I-Dang refugee camp for seven or eight months until July 1980. Each week, the Red Cross and the UNHCR handed out rice and salt to each family based on the number of people registered in the family. At times, my parents traded in some of their gold for Thai Baht money to purchase additional rice. Most days, my brother and I played soccer with other kids. We attended English classes whenever available, which usually amounted to a few times per week for an hour. But most of the time, we eagerly awaited for our names to be called to start the resettlement process. In early July 1980, after having stayed at the camp for seven months, our names were called. During the interview process with the UNHCR, they determined that both my parents had sisters in Paris, France. They offered us a choice to either resettle to France or to the United States. My parents opted for the United States which delayed our resettlement process for a few more weeks. Right about the same time, my brother and I would do what the other older boys in the camp did by sneaking out late at night into the city of Aranyaprathet’s street market. We purchased just one thing, chicken. Back at the refugee camp, each chicken could be sold for at least a 200 percent profit. We continued to sneak out with the other kids until one night on a return trip when the tower guards spotted us outside the barbed wires. Perhaps, due to some sort of a misunderstanding, one of the older kids was shot dead. Separated from my brother, I was so scared that I hid in the tall grass for hours as the lights from the towers continued to beam across the camp's grounds. At daybreak when it was calm, I snuck back into the camp site to return to our unit to find my brother. He was a bit upset with me as I was supposed to have two chickens instead of one. My parents were extremely angry and afraid so we stopped sneaking out. Toward the end of July 1980, they approved our resettlement to the United States. We were transferred by truck to another refugee camp in Chonburi, Thailand. The Chonburi refugee camp was 40 miles south of Bangkok and was set up as a processing and transit camp for refugees awaiting resettlement to other countries. Unlike previous refugee camps, the living quarters were nice. Each unit was shared with multiple families. Our family area is shown in the first picture below. It was a simple small cozy corner area where we slept on the floor. My mother is shown pregnant with my younger brother, Chhay. He was born at the refugee camp toward the end of October 1980. ﻿We stayed at the Chonburi refugee camp for four or five months until November 1980. We continued to receive basic weekly food supplies from the Red Cross and the UNHCR. We continued to attend English classes whenever they were available. But most of the time, we played soccer with other kids. My parents eagerly checked at the office each day for our names to be listed to start the next process of the resettlement. As needed, my mother continued to exchange some of her gold for Thai Baht currency to purchase additional rice and other food. One day in November 1980, our names came up and UNHCR transferred us to yet another refugee camp inside Thailand, called Lumpini in the city of Bangkok. Lumpini was another transit refugee camp site setup by UNHCR. We stayed only a couple of weeks before we were transported to the Galang Refugee Camp on Galang Island in Indonesia. Galang is a small island 50 miles south of Singapore. This was a special transit camp for refugees in Southeast Asia who were approved for resettlement. The primary host countries were mainly the United States, Canada, and Australia, and some refugees were resettled to France, Denmark, Switzerland, and Germany. We stayed at Galang for about six months until April 1981. UNHCR provided daily English instructions and cultural awareness to us about our designated host country. Galang was an open Island, so we roamed around freely. My brother and I along with other kids spent a lot of time on the seashore, climbing trees in the jungle, eating wild fruits, swimming and catching fish in the ocean. One time I remember eating so many different kinds of wild fruits that I felt sick. We played soccer often at Galang; usually it was the Cambodians against the Vietnamese players. While playing soccer one time, I fell and bumped my chin against a cement corner that cut across my chin pretty deep. I was rushed to the hospital, and they stitched me up. To this day, I still have a nasty cut mark under my chin. On March 3, 1981, the UNHCR processed our paperwork and took this family picture below as part of the paperwork process. This meant it was very close in time for us to be transported to our host country, the United States. We were very excited and happy. Toward the end of April 1981, we were delighted to see our names scheduled for transport to Sembawang, Singapore, another transit refugee camp location. We boarded a small transport boat from Galang, Indonesia to Singapore. We stayed in Singapore for two weeks before we started our final leg of the journey to America. On May 5, 1981, we arrived in San Francisco’s port of entry. It took us 848 days or 2 years, 3 months, 28 days after the fall of the Khmer Rouge on January 7, 1979 to reach America on May 5, 1981. 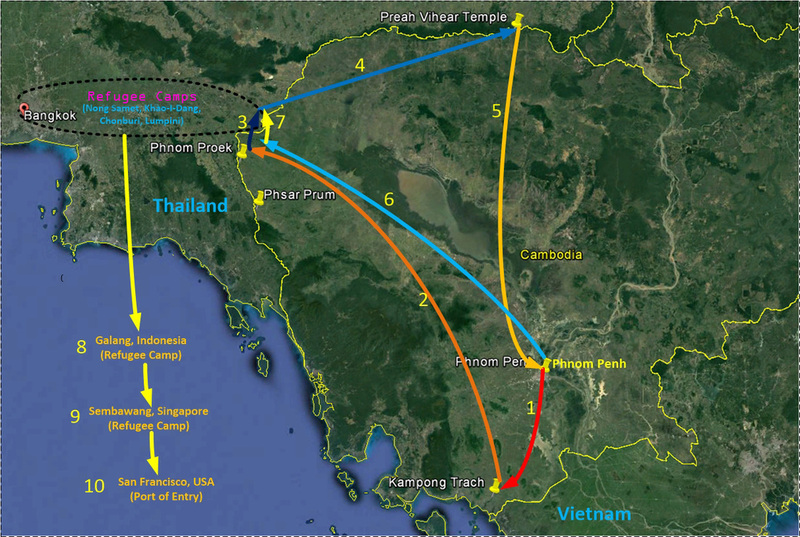 Route#7: Crossed into Thailand and were placed in Khao-I-Dang refugee camp. Migrated through multiple refugee camps within Thailand.